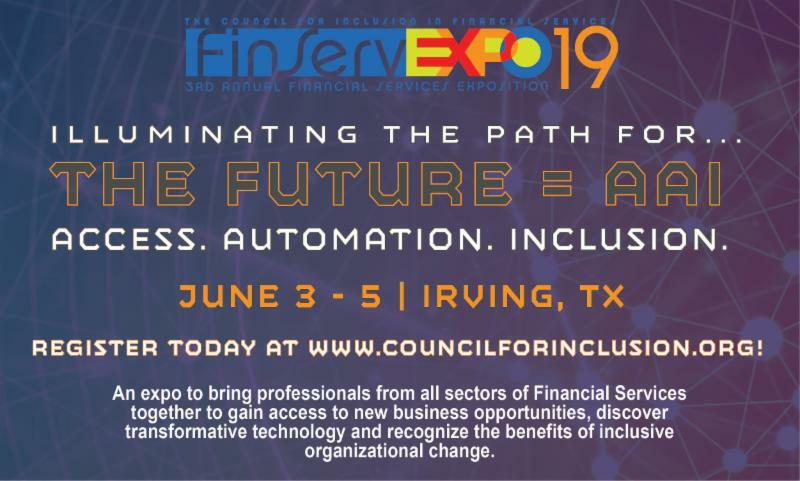 The 3rd Annual National FinServ Expo: The Future =AAI, Hosted by The Council for Inclusion in Financial Services (CIFS), will take place June 4th & 5th at the Irving Convention Center in Irving, Texas. This unique expo brings together all contributors of the Financial Services Industry - from housing and insurance to traditional banking and auto finance - to gain knowledge of strategies to remove barriers that restrict access to new business opportunities, to discover transformative technology and to recognize the benefits of inclusive organizational change. The attendees will gain knowledge of strategic solutions that illuminate the path for the future of the Financial Services industry; learn about the latest trends in technology that will elevate their business models and will hear from top subject matter experts in financial services, technology and personal development.